Roses may be the flowers of love and romance, but there's nothing romantic about spindly canes sporting spider mites, beetles and mildew instead of beautiful flowers. Just as romance sometimes needs a little helping along, so do your roses. 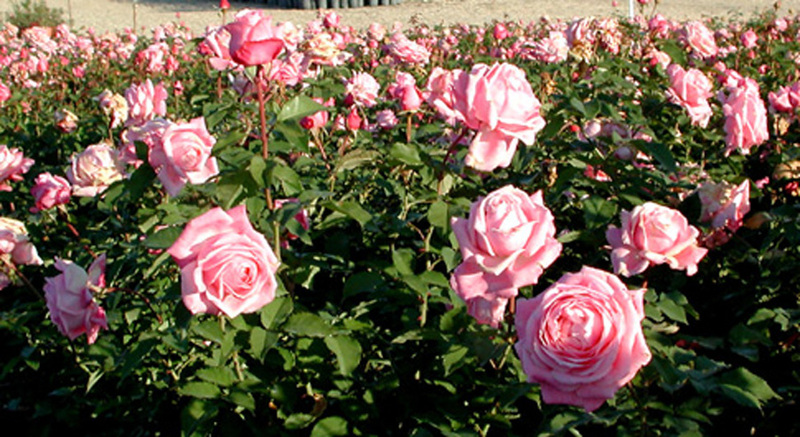 Selection of the "best" rose variety results in healthy plants which are less susceptible to pest attack. All of this spraying required to ensure survival and bloom of modern roses is too much and too expensive for most gardeners. 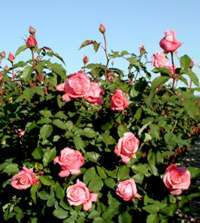 Most of us would enjoy rose growing much more if we could find rose varieties which would yield blooms yet did not require constant spraying. This is possible. There is a rose which does not need constant spraying to survive and produce lovely blooms. Infection of this rose variety with black spot fungus and powdery mildew (white powder-like substance) on the leaves WILL OCCUR when conditions are most favorable for disease yet there is a rose which WILL survive and WILL produce an abundance of quality flowers. 'Belinda's Dream' is a gorgeous shrub rose with large, fragrant and very double pink blossoms. It produces successive flushes of bloom spring to frost and is so disease tolerant that fungicide sprays are seldom required. 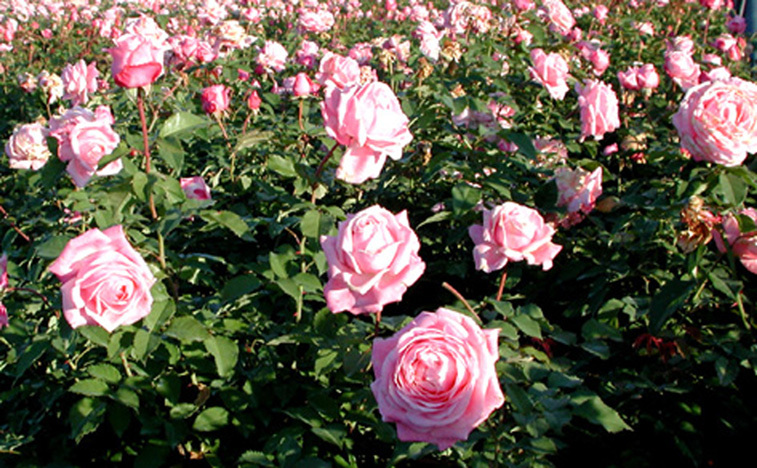 It is a near perfect landscape rose and is an outstanding performer even in highly alkaline clay soils. 'Belinda's Dream' is not purely an old-fashioned or antique rose. Many of us have been misled into believing that because antique roses are old they are disease resistant. 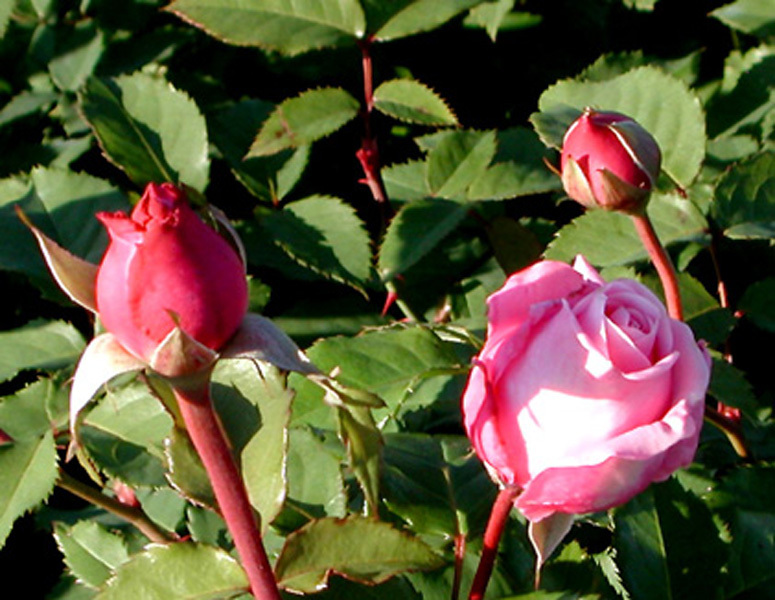 Many of the antique roses can survive without pesticide sprays. However, the quality of bloom, especially for cut flowers, produced cannot equal and are not acceptable to most rose growers. If someone is going to grow roses, they want the flower produced to resemble that which most people consider to be a rose. 'Belinda's Dream' rose looks like a real rose BUT has the toughness of the antiques and old-fashioned types. 'Belinda's Dream' is an attractive, durable, and versatile rose that gardeners will fall in love with. 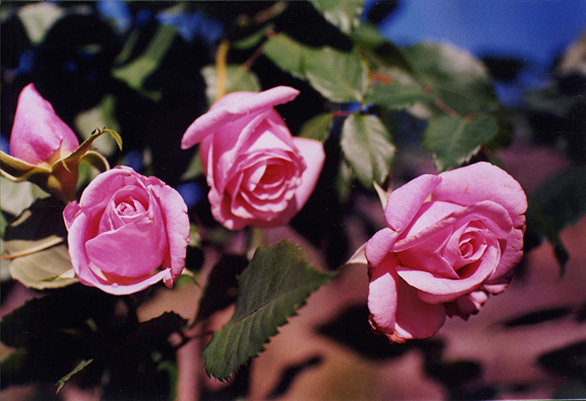 'Belinda's Dream's' is a shrub rose with characteristics of a hybrid tea, such as the high center bloom and long stem. The medium pink flowers are produced in abundance throughout the growing season. The large, double flowers are set against the background of glossy, bluish-green foliage. One characteristic that people expect out of rose is fragrance and 'Belinda's Dream' has a rich delightful fragrance all it's own. Dr. Robert Bayse, the developer of 'Belinda's Dream', a retired mathematics professor at A&M University, has been breeding roses for most of his life. Dr. Bayse's goals were to develop thornless, hardy, drought tolerant, and disease resistant cultivar. 'Belinda's Dream' was the result of a cross between 'Tiffany' and 'Jersey Beauty'. However, he was hesitant of releasing this rose because it was not thornless. Dr. Bayse finely agreed to release 'Belinda's Dream' in 1988 and he named the rose for the daughter of a friend in Caldwell, Texas. 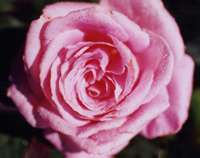 The Texas Agricultural Extension Service has tested this rose for several years in trial grounds throughout the state. In March 2002, it will be promoted as a Texas Superstar. In order for a plant to be selected as a Texas Superstar, it must meet certain criteria such as cold hardness, heat resistant, insect, and disease tolerant. Although this rose is not disease resistant and can occasionally be attacked by black spot during cool, moist periods, it is vigorous enough to overcome the disease. 'Belinda's Dream' is a fast growing shrub with a sturdy, upright habit. It can reach 5 feet in height by 3-4 feet wide. 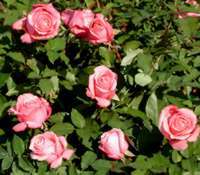 An easily maintain rose that only requires one major pruning each spring after the last chance for a freeze. Plants should be fertilized after this pruning and again after first bud development. Throughout the rest of the year, fertilizer should be applied on a regular basis since roses are heavy feeders. Watering should be done by hand or drip irrigation to keep water from splashing onto foliage and spreading diseases. Watering thoroughly and deeply will encourage the roots to grow deeper and the results will be a more drought tolerant plant. Applying mulch will help retain moisture, keep weeds out, and adds nutrients to the soil. Roses should be planted in a well-drained area where there is at least 6 to 8 hours of direct sunlight. This versatile rose can be easily used in mixed borders, hedges, tubs, barrels, formal, and informal gardens. It is perfect for fresh-cut flowers and for dried floral arrangements. The persistent nature of 'Belinda's Dream' and the many uses this plant can provide make this one of the best gardening buys around. Plants can be purchased mail order from the Antique Rose Emporium www.antiqueroseemporium.com/ or look for the Hines 'Belinda's Dream' label at your local retail nursery.